Nine years have passed since the attacks of September 11. Attacks that breached the Pentagon’s walls, maimed Manhattan, scarred rural Pennsylvania and erased some 3,000 innocent lives. The American people may choose to forget or suppress what happened that terrible Tuesday morning, but their military has not. 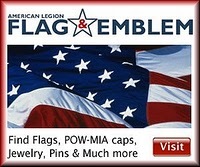 Just consider how the Navy is remembering Sept. 11. Indeed, Military Times reports that the ship can carry hundreds of Marines and Special Ops forces into battle, as well as helicopters and MV-22 Ospreys. But New York is just one of three billion-dollar amphibious warships named in honor of locales directly affected by the 9/11 attacks. The other two ships include USS Somerset, named for the county in rural Pennsylvania where Flight 93 went down, and USS Arlington, named in honor of the Pentagon. Moreover, the location of a press conference is usually irrelevant, but on Sept.11, it made all the difference in the world. The message was unmistakable, and it was intended as much for a domestic audience as an international one: The United States is scarred but standing. Like the World Trade Center, the Pentagon was targeted because of what it represents. It is a symbol of America’s freedom, diversity and, yes, power. No other country in history has so often or so freely used its military power to help others. As a consequence, the U.S. military has made its share of friends and enemies. Within the Pentagon’s five walls, Americans have planned peacekeeping operations for the Balkans and Lebanon, humanitarian efforts to save Berliners and Bangladeshis and rescue missions to defend Korea and Vietnam. Americans have also planned the defeat of German fascism, Japanese militarism, Soviet communism, and in the years since 9/11, global jihadism. Sadly, the jihadists choose to forget that U.S. troops have liberated Muslim Kuwait, Afghanistan and Iraq; protected Muslim Kurdistan, Muslim Bosnia and Muslim Kosovo; fed Muslim Somalia; and aided Muslim Indonesia and Muslim Pakistan after natural disasters of biblical proportion. The roll call of those targeted and killed by the jihadists during the attack on the Pentagon was a reflection of the United States: computer technicians and engineers, writers and designers, accountants and lawyers, sailors and soldiers, teachers and students, and even a Cub Scout den leader who held meetings at an American Legion post. The list goes on. The Pentagon burned and buckled, but like America, it endured. And like America, it stands today, in open defiance of its enemies. Additionally, Somerset played an equally powerful and poignant part on 9/11. Before Flight 93 passengers became “United 93,” in Greengrass’ fitting thumbnail description, these average Americans wrestled with all the emotions we came to know in the days and months that followed 9/11: confusion and disbelief, fear and terror, shock and anger, desperation and despair. But the passengers would not be victims. By choice, by their collective will, they would actually change history and spare their countrymen yet another trauma. Phone calls, voicemail messages and cockpit recordings indicate that, like us, the men and women of Flight 93 argued about what to do and what not to do, about risks and dangers, about what the enemy was planning. They prayed and cried. They considered other options. And then they finally came to grips with the only option left – taking the fight to the enemy. And that they did. The first counterstrike against al-Qaeda, the first battle in what would be called the global war on terror, happened some 30,000 feet above Pennsylvania and ended in Somerset County. 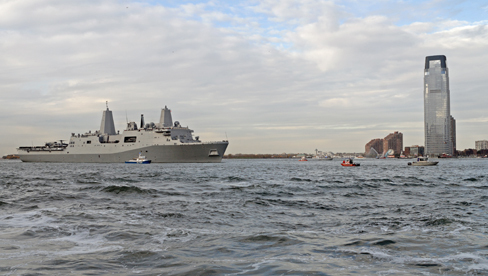 USS Somerset and USS Arlington will join USS New York – and the battle – in 2011 and 2012.